Summer is a great time for thinking about your winter wardrobe, if you can face it. 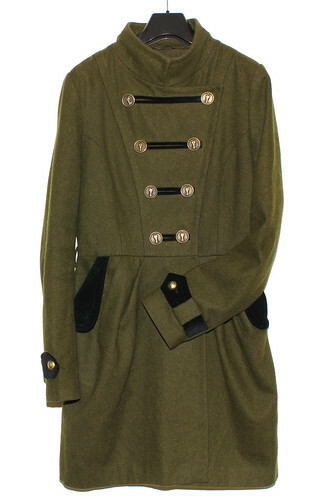 A few weeks ago I picked up a fantastic, long, military style, wool coat in a local charity shop. Three of the buttons were missing but it was otherwise in fantastic condition, and only required some minor de-fuzzing. Today I’m rejoicing the purchase as the weather seems to have taken a turn for the worse. Yesterday I was in Portugal, wondering if I’d applied enough sun block; today I’m contemplating whether I should put gloves on in the house. The coat came with very nice, domed, brass-effect buttons, but I couldn’t find a match and ended up replacing them all with real brass buttons from Liberty, at a cost of considerably more than the coat, but a pittance compared with the cost of a new coat. 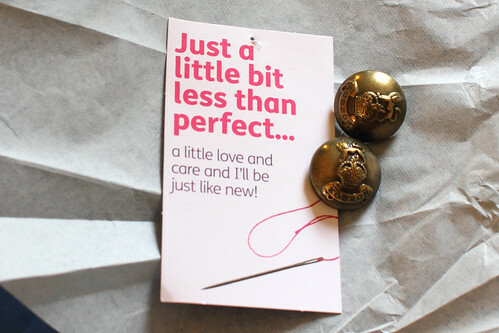 Liberty is my shop of choice for interesting buttons – the price is fair for the quality and I can always find the right finishing touch for my project. 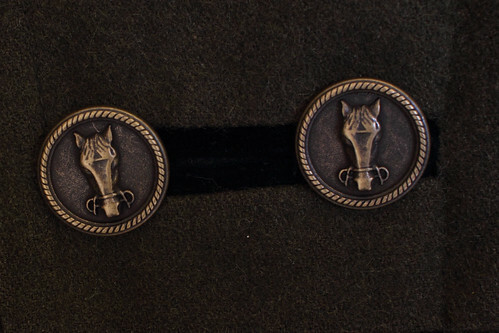 The jacket has a certain equestrian air formed by the gathered shape on the hip, and the button motif echoes this nicely. I think it’s a shame that someone discarded this jacket for want of 10 minutes of sewing, but selfishly, their loss is my gain. For under £20 I’m now set up for autumn.